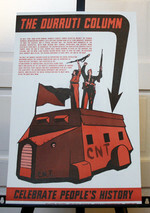 "The Durruti Column poster" added to cart. We noticed that you are ordering a poster. Buy a poster tube to protect it. Otherwise, we will fold your poster to fit in an envelope.